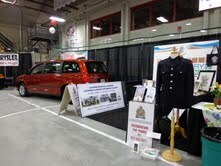 Thank you to all who helped out at the trade show. It was a big success and we had a lot of interest. Diane Smith and Debbie Gillard. 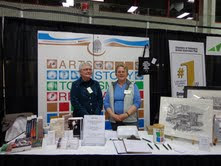 These were just two of the many people who helped out by manning the booth. We were pleased to be a part of the trade show and look forward to more opportunities to exhibit what we have to offer to the community. And no, the red van in the back of this picture does not belong to us.